Phil Ryan 2007 18 72 7343 30 minutes from downtown. 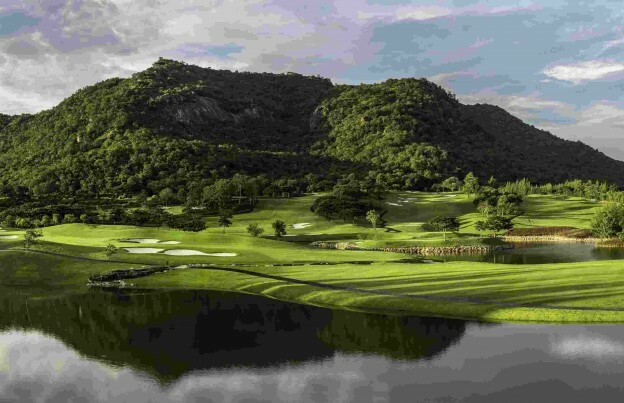 Black Mountain Golf Club in Hua Hin is one of the best Championship golf courses in Thailand. The designer Phil Ryan has retained all the natural features of the surrounding environment to create this masterpiece of a golf course. The course nestles in a valley, within touching distance of the ‘Black Mountains’ which take their name from large black rocks set into the mountain providing a magnificent backdrop to most of the holes. The Black Mountain Golf Club course is designed to be a test for the top golfers in the world but also very playable and enjoyable to the average golfer. The design offers generous fairways for the shorter hitter but becoming narrower for the longer hitter. The greens are large with many pin positions, with different degrees of difficulty, and the course is well protected by beautifully sculptured bunkers. The clubhouse offers a stunning panoramic view over the whole course and facilities fine dining in a 5 star restaurant, a well stocked pro shop and luxurious locker facilities.